In client-vendor business relationships, there are many transactions that occur. Each transaction provides an opportunity for unintended errors. 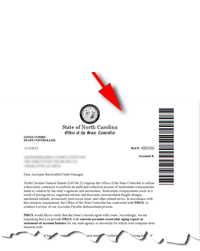 As a vendor doing business with the State of North Carolina, these errors could cost the taxpayers of the state unnecessary dollars. To monitor this, North Carolina G.S. 147-86.22 requires the Office of the State Controller (OSC) to negotiate a contract with a third party to perform an audit and collection process of inadvertent overpayments by State agencies. For FY2014-2018, the contract for the inadvertent overpayments audit has been awarded to PRGX of Grand Rapids, MI. This legislation states: “(T)he State Controller shall negotiate a contract with a third party to perform an audit and collection process of inadvertent overpayments by State agencies to vendors as a result of pricing errors, neglected rebates and discounts, miscalculated freight charges, unclaimed refunds, erroneously paid excise taxes, and related errors. The third party shall be compensated only from funds recovered as a result of the audit.” This legislation further stipulates that this work does not apply to the purchase of medical services by State agencies or payments used to reimburse or otherwise pay for health care services.